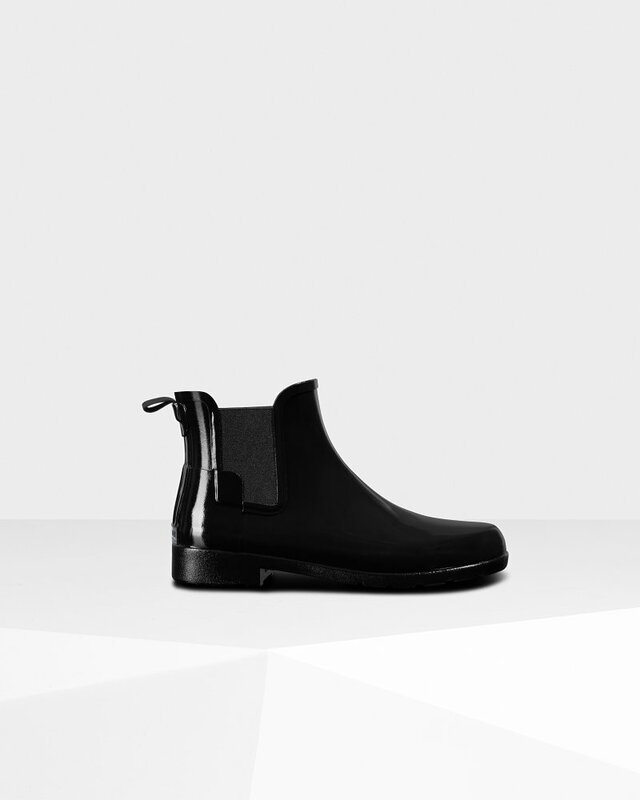 Women's Refined Gloss Slim Fit Chelsea Boot is rated 4.0 out of 5 by 14. Version encore plus ajustée, idéale pour la vie urbaine, les Chelsea raffinées pour femme se démarquent par une forme cintrée et une semelle intérieure moulée, parfaites pour le quotidien. Prêtes à affronter la pluie, ces bottes, version ré-imaginée de la bottine classique, sont fabriquées à la main à partir de caoutchouc naturel et vulcanisées pour une protection supérieure. Elles conservent les caractéristiques cultes de la Chelsea traditionnelle, les goussets élastiques et la languette en nylon permettant un enfilage et un retrait faciles. Parfaites pour tout, des déplacements en ville aux dîners d'affaires, ces bottes imperméables avec finition brillante sont des incontournables pour temps pluvieux. Rated 3 out of 5 by Santa Mom from Too expensive! Bought these boots for my daughter for Christmas. She was happy but I thought they were too expensive for rubber boots. Shipping was very good. Order came quickly. Rated 5 out of 5 by PNWopinion from Top-Quality & Style So happy with my Refined Slim Fit Chelsea Gloss boots (black)! They are so stylish and of-course functional. I was a little surprised by the fit tho... in most shoes I wear a 6.5 BUT my Hunter Original Tall Rain Boots are a size: 5. I decided to order one full-size-up in these Refined Chelsea boots and they just fit with a relatively thin sock. These boots run small. My feet are quite narrow but I don't think I could get away with a thicker wool-type winter sock (in the colder months). For that I would have needed to get a size: 7. Anyway, I truly love these boots and highly recommend (to dress up or down). Just thought I'd share my observations about sizing as I always find that useful when I'm online shopping. Rated 4 out of 5 by Marjorie from I am sad as they did not fit. Definitely fit on the small size. Normally that size is on the big end for me. Not this time. Also sad as i bought them on sale and can not return them. Rated 2 out of 5 by Lauren from The fit was more narrow through the toe box than the original Chelsea. Rated 5 out of 5 by Lesley from My daughter's 3rd of Hunter Boots. Great quality. Worth every $ spent & they look great too. Rated 5 out of 5 by Jennifer from I bought these boots to wear to work during the winter as a classier alternative to my Sorrells or my tall Hunter boots. When I first took them out of the box and tried them on I thought I would be returning them. The toe wasn't as pointed as I hoped (was thinking more traditional Chelsea boot style). But that night I was heading to a bar with an outdoor icebar and they were the perfect thing to wear so I threw them on and I've been in love ever since. They are BEYOND comfy, they go with everything, they are perfect for winter slush but I can also see them being perfect for spring and summer as well! Definitely recommend! I got my regular size 10 - they fit perfectly.